Not only did the fertilizer crisis create effects in local politics but it also involved the decision making process in Pakistan as a country exporting such agriculture inputs. Apart from the apparent absence of a contingency plan for the import of fertilizer, the decision by the Pakistani government also resulted in a shortage in local supply. The major shortage of Urea fertilizer for paddy farming led to consternation among cultivators here. Disappointed with non-availability of fertilizer for their tender paddy plants, these farmers in the key agricultural districts took on politicians from the ruling parties - the UNP and the SLFP - to task when they called in at their doorsteps these days for canvassing votes for the local government polls to be conducted on February 10, 2018. Farmers remain with despondency as their paddy fields have started wilting and yellowing due to the non-application of fertilizer at the right time and scarcity of rains. Against this backdrop, the Cabinet of Ministers had its inaugural meeting for the New Year on Tuesday with President Maithripala Sirisena chairing it as usual. Agriculture Minister Duminda Dissanayake had to take the brunt of criticism from his Cabinet colleagues in the aftermath of the dawn of the New Year. The Ministers berated him for not having a contingency plan to replenish stocks of fertilizer to be disposed in time when and where necessary during the season. His inefficiency, the ministers said, would cost the government dearly at the upcoming local government elections in the paddy cultivating districts. In Sri Lanka, Anuradhapura, Polonnaruwa, Ampara, Hambantota and Kurunegala are considered the leading districts cultivating rice for domestic consumption in main. Besides, paddy is cultivated in great proportion in some districts of the northern and eastern provinces. So, the two-main parties in the unity government are naturally fearsome of political implications arising from the fertilizer crisis. Housing and Construction Minister Sajith Premadasa, who represents Hambantota, appeared to have felt the pinch in this regard. As such, he was more vocal in his criticism at the Cabinet. “Today, people question us whenever we go to meet them. They see us as part of a government which is incapable of distributing fertilizer even,” he told the Cabinet. Minister Dissanayake cited the delay in the international supply chain caused the shortage in the local market. So, for the resolution of the issue, apart from measures to root out local inefficiency, international engagement was needed to get the ban imposed by Pakistan lifted. Pakistan, as a leading supplier of Urea to the global market, banned the export from December 31, last year onwards. 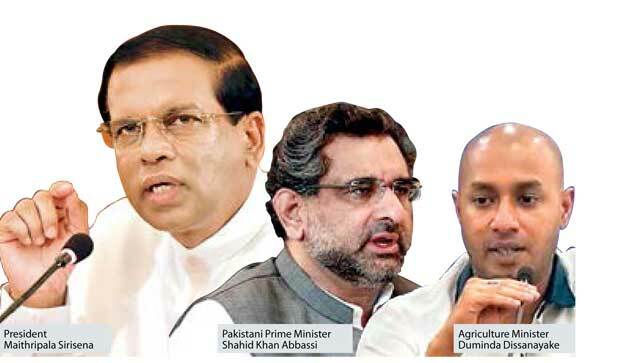 However, President Sirisena contacted the Pakistani Prime Minister Shahid Khan Abbassi and asked for the immediate dispatch of 75,000 tonnes of urea. Pakistan banned the export of urea to all countries by the time. So, for the reversal of this decision in respect of one country, at a personal request from its Head of State, the Pakistani Premier had to convene a meeting of the Economic Coordination Committee (ECC). The Committee, chaired by the Premier himself, is an institution taking decisions on vital matters related to economic and geo-politics. Afterwards, the Pakistani PM, according to sources, even contacted the Federal Ministers. Finally, the Pakistani government managed to grant an exception of the ban to Sri Lanka. So, it will send 75,000 tonnes of urea to Sri Lanka. The exception, granted here, is seen as a gesture of friendship towards the island nation. In that manner, there were involvements for decision-making; both in Sri Lanka and Pakistan, to address the fertilizer shortage here. The stocks are yet to arrive in Sri Lanka, though. Here, the farmers have been suffering from crop failures for three consecutive seasons due to adverse weather conditions. As a result of which, the need to fertilize for cultivation in this season is felt even more severely than in the past. Disaster Management Minister Anura Priyadarshana Yapa asked the government to issue fertilizer free of charge to farmers this time to straighten out their difficulties.